Houston, TX (April 22, 2019) – Houston Safari Club Foundation (HSCF) is now accepting nominations for its first Conservationist of the Year Award. Beginning January 2020, Houston Safari Club Foundation will honor an exceptional champion of conservation through this annual award. The HSCF Conservationist of the Year Award recognizes individuals or organizations exemplifying a true servant’s heart for conservation. Nominees are considered for their works related to education, advocacy, legislation, policy, environmental activities, and the protection and preservation of wildlife and habitat. Nominations may be made by and for individuals or organizations. The winner will be recognized for this achievement with the presentation of this award at the annual HSCF Convention and Hunting Expo, January 24-26, 2020. No monetary award will be given to the recipient of the award. Visit the HSCF website at hscfdn.org/convention/awards/ for nomination forms and information or call 713.623.8844 for more information. Nominations are due to HSCF by October 1st, 2019. Houston Safari Club Foundation (HSCF) is a 501(c)(3) non-profit organization whose mission is to preserve the sport of hunting through education, conservation, and the promotion of our hunting heritage. HSCF has awarded 525 scholarships totaling $2.25 million dollars. HSCF conducts youth outdoor education programs, career training, hunter education and field experiences throughout the year. HSCF has provided over $3.7 million in grants for hunter-funded wildlife, habitat and various conservation initiatives. HSCF is an independent organization, is not affiliated with Safari Club International (SCI) or its affiliates and is not a chapter or affiliate of any other organization. Visit our website at hscfdn.org or call 713.623.8844 for more information. Houston, TX (April 04, 2019) – Houston Safari Club Foundation (HSCF) is now accepting collegiate scholarship applications for its annual Dan L Duncan Scholarship award program. Houston Safari Club Foundation is committed to furthering the education of students pursuing a career in conservation. Houston Safari Club Foundation (HSCF) proudly presents the Dan L. Duncan Scholarship Program. 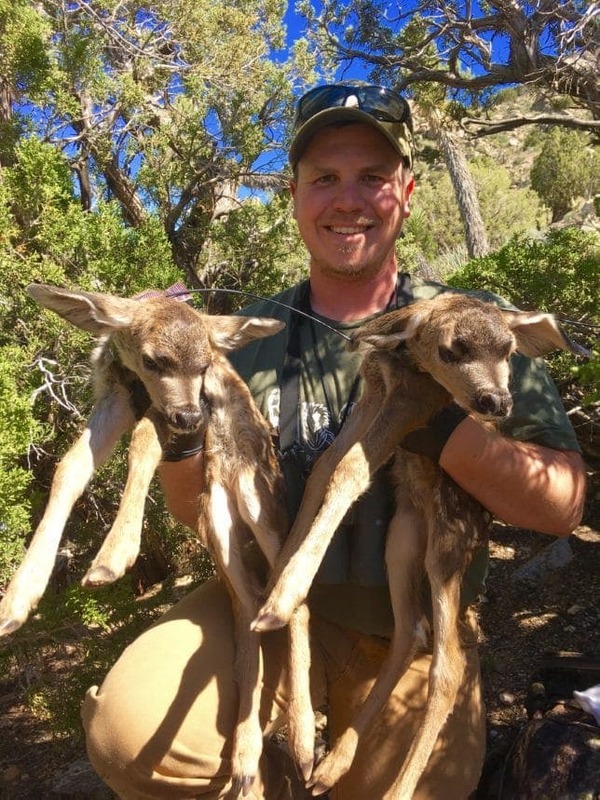 HSCF annually awards scholarships to students currently involved in the study of Wildlife Management, Range Management or related studies. Since the program’s inception in 1999, 525 scholarships have been awarded, totaling almost $2.25 million dollars. HSCF proudly recognizes and encourages students, who have exhibited academic excellence and exemplary character, through our prestigious scholarship program. HSCF understands the future of conservation depends on the education of bright and gifted scholars who will work to protect hunter’s rights and wildlife conservation for decades to come. Many HSCF scholarship recipients have become thought leaders and game-changers in the conservation world. Applicants must be active hunters and enrolled in an accredited Texas university. Applications must be received no later than June 1st. Full scholarship information may be found here. Houston, TX (March 27, 2019) – Houston Safari Club Foundation (HSCF) proudly announces Capital Farm Credit is continuing their support of education, conservation and hunters’ rights by extending their partnership with Houston Safari Club Foundation. Through the continued support of Capital Farm Credit, HSCF will further its efforts in scholarship, youth education programs, youth shooting sports, wildlife and habitat conservation, research and more. Capital Farm Credit has provided financing to Texas farmers, ranchers, rural property owners and agribusinesses for more than 100 years. Headquartered in Bryan, CFC has offices serving most of Texas. For more information about its patronage dividend program, financial services and office locations, visit CapitalFarmCredit.com. Houston, TX- – Houston Safari Club Foundation (HSCF) is pleased to announce Paul Bamber of Wanganui Safaris as the 2019 HSCF Professional Hunter of the Year. Paul Bamber grew up on a remote family farm at Jerusalem, on the Wanganui River, farming sheep and cattle. Paul developed a love of hunting at the age of 10 when his dad gave him his .303 to hunt a big boar his sheep dogs were bailing. From that day forward, whenever Paul wasn’t at school, he hunted goats, pigs and deer as well as trapping possums for money in the winter. With huge areas of bush surrounding their farm, and no predators, it was a constant battle to keep wild animal numbers from taking over the land they farmed. Wild pigs would kill hundreds of lambs if unchecked and opossum numbers were out of control. Paul and his brother would hunt stags and goats, retrieve them on horseback and three wheelers, and sell them to buyers in Wanganui. Paul saved every dollar earned to buy new guns and find new areas to hunt. In the 70’s and 80’s, Paul began to trap deer and goats, jumping out of Hughes 500 helicopters. It proved to be more profitable and more fun than farming. In the late 80’s Paul persuaded his father to give up sheep farming and get into the trophy hunting business. They built a lodge and headed to their first SCI show in Reno. There were about 300 exhibitors in total and only 5 New Zealand outfitters. They only sold one hunt to a car salesman from Nebraska at the show and they remain great friends to this day. Undeterred they returned the following year and attended the Dallas Safari Club (DSC) show as well as SCI. Paul felt the shows were great fun and the Kiwis and African outfitters always teamed up to talk rugby. The following year they added the Houston Safari Club and Nebraska outfitter shows to their itinerary. In the early 90’s, Kelly Samson of Klineburger Travel asked Paul to head to Mongolia to hunt Elk. Paul loved Mongolia and the people. Paul recalls, “During our many travels we got terribly sick drinking fermented horse milk in remote yurt’s, rode horrible little ponies with horrible wooden saddles, saw thousands of elk, saw the elusive snow leopard and succeeded in getting detained for 3 days by the Russian military as they thought we were CIA spies.” Later, the breakup of the Soviet Union and free market policies ended Paul’s experiences in Mongolia. Trips to Australia to hunt Water Buffalo and Dingo’s out of Darwin and Rusa on Marble Island soon followed. By now, Paul had two small boys, Earl and William. The boys began to join Paul on trips to hunting shows in the US. At an early age, Paul’s sons began hunting rabbits and running go karts for something fun to do on weekends. Little did Paul know that the go kart hobby would turn into a career of professional driving, as Earl would go on to become a two-time winner of the Porsche Carrera Cup and the Porsche Super-Cup. Earl was then signed as a Porsche factory driver and has since gone on to be a two-time winner of the world’s biggest and most famous endurance race-the 24 Hours of Le Mans.Paul’s son William put himself through university graduating with a bachelor’s degree in Design. William then headed straight to Kuala Lumpur to become a highly successful driver, racing with the Porsche team as well. Paul’s sons have since formed a race car company with Earl running four cars as well as coaching drivers all over Asia. Paul will be recognized during the Friday night banquet at the 2019 HSCF Convention. 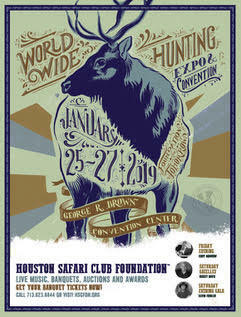 Registration for HSCF’s 2019 Worldwide Convention and Hunting Expo is open. The event will take place January 25-27, 2019 in downtown Houston at the George R. Brown (GRB) Convention Center. Banquet tickets and hotel reservations may be made here. HSCF sincerely thanks its Convention sponsors: Wildlife Partners, Capital Farm Credit, Enterprise Products Partners L.P., S&B Engineers and Constructors, Global Rescue, Hess Corporation, Conroe Taxidermy, Silver Eagle/Budweiser, Art by L. Mower, B&B Taxidermy, NRA Women’s Leadership Forum, Bushmen Safaris, Travel With Guns, Hawkeye Hunting Club, Pro Cargo USA, Del Rio Powersports, Alliance Graphics & Printing.